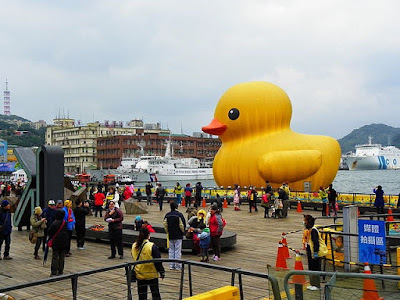 A Few Paragraphs: The return of Bio-Duck! 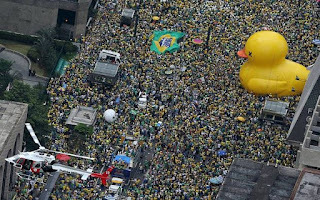 The cities of Brazil are seething with turmoil these days as thousands fill the streets of São Paulo and Rio, clamoring angrily for the ouster of their corrupt President Dilma Rousseff. A historically large 500,000 person demonstration flooded São Paulo last Sunday, so large and focused on impeachment that no one seemed to notice the enormous, ominous, otherwise inexplicable yellow figure looming above them all... as though orchestating the chaos. As indeed he was. Sure, you've got your Bilderbergers and you've got your Illuminati, but behind it all yellow wing-tips truly manipulate the levers of power.